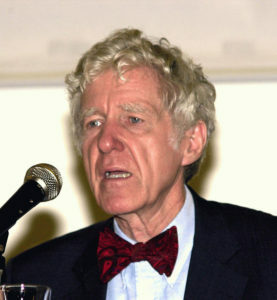 Lester R. Brown (b.1934) is well-known as the founder of the Worldwatch Institute in Washington in 1974, where he served as president until 2000. Worldwatch is known for its annual State of the World reports since 1984, annual Vital Signs analysis of key environmental indicators, and occasional papers—notably, for the S&S Guide, Redefining National Security by Brown (Worldwatch Paper 14, Oct 1977, 46p), on new threats from deterioration of earth’s biological systems, climate modification, and food insecurity. Brown founded the Earth Policy Institute in 2001 (closed in 2015 when he retired) to promote his plan to save civilization, e.g. Plan B 4.0: Mobilizing to Save Civilization (2009) on population pressure, stabilizing climate, the energy transition, restoring the earth, shifting taxes and subsidies, and “feeding 8 billion people well.” Brown has authored or co-authored more than 50 books, many translated into dozens of languages, including Building a Sustainable Society (1981), Who Will Feed China? (1995), Eco-Economy (2001), Outgrowing the Earth (2004), and The Great Transition (2015) on shifting away from fossil fuels. His autobiography, Breaking New Ground (2013), is especially illuminating. He has dozens of prizes and awards, including a MacArthur fellowship (1986), the UN Environmental Prize (1987), and the Distinguished Service Award of the World Future Society (2014), and was designated as one of the top 100 global thinkers by Foreign Policy (2010; 2011).